Finding someone’s email address, starting from a social profile (such as a LinkedIn profile), and finding social profiles, starting from an email address, are two kinds of top-requested productivity tools for Sourcers, Recruiters, Sales Professionals, and Social Media Marketers these days, for many good reasons, such as the new rigid limitations for both searching for professionals and for sending InMails on LinkedIn. Here are some tools in each of the two categories. Rapportive: shows a LinkedIn profile and, possibly, your “degree of connectedness” on LinkedIn, some connections in common, and a link to connect. It shows the Twitter handle too, but only if it’s attached to the person’s LinkedIn profile. Rapporto was a “hacked” version of Rapportive and a temporary fix for losing the previous Rapportive functionality, but, it seems, it has stopped working altogether. Vibe shows social profiles when you hover over an email address anywhere on a page. Fullcontact for Gmail (Beta) operates in your Gmail contacts. It shows social profiles and other information about the person and company. Sidekick by Hubspot is for tracking email; also shows social profiles and information about the person and company. It has a Gmail and a MS Outlook versions. Outlook Social Connector shows Facebook, LinkedIn, and XING profiles and the latest updates. It has been unreliable (for me) lately in getting information from LinkedIn. Nimble (free trial) is a teaser, since it offers to load whole large lists in a variety of formats. It does look up some social profiles – but only when you view the profile in question – not for the list in batch. Discover.ly finds some social profiles from an email address in Gmail Inbox only (it doesn’t work in a “compose” window), as part of its functionality. Just paste the email address into the Facebook search box and into Google-Plus search box to identify the profile registered with the address. In Gmail, see the “connected” profile for any contact – automatically. Connect Twitter with a Gmail account, to cross-reference email addresses (this only works if your Gmail has under a couple hundred entries or so). 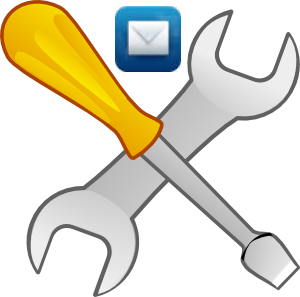 If you use one of the above tools, you can try email permutations with the hopes to uncover the correct email address. Prophet: Starting with a social profile on Facebook, Twitter, or a profile on “the large social network based out of Mountain View”, it shows other social data and can try to guess and verify email addresses. Connectifier has stopped working for me some time ago, but some colleagues can still access its database on trial basis. Connect6 PeopleDiscovery shows social data and now charges $1 to find an email address. 360social shows email addresses for some people. Sign up for the Tools webinar coming up on Thursday January 29, 2015, to hear all about these tools, with a detailed side-by-side comparison, as well as 50+ other tools! I didnt event think about the pasting of email in facebook to search for profiles. Odd thing is this worked earlier when I did it but ever since I got home I cant get it to work. Anyone else have this happen to them.